A pan of roasted vegetables is one of my most favorite things, but I always serve them as a side dish. For something as wonderful as roasted veggies I figured it was time to make them the main show, so a couple weeks ago I did just that and made this roasted vegetable pasta. 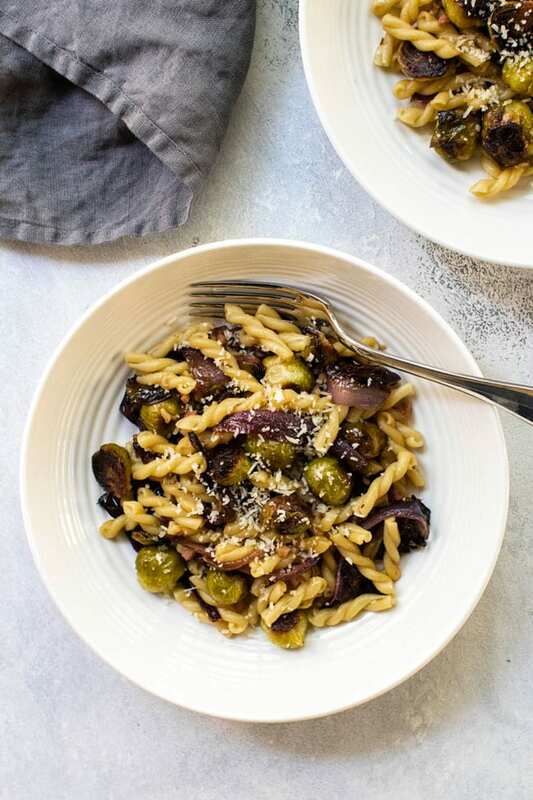 Gemelli tossed in fresh lemon juice, grated Parmesan with pancetta, caramelized Brussels sprouts, and red onion makes a simple and light dinner – this roasted vegetable pasta is perfect post-holiday when you want something comforting but not heavy. I’ve been known to roast a veggie or two (see roasted sweet potatoes and roasted parmesan potatoes as evidence of my obsession) and most of the time when I pull a sheet pan of caramelized vegetables from the oven I intend to serve it as a side dish. And so it was a few weeks ago I decided to change things up and give some roasted veggies top billing as the main course. Last August I shared some roasted vegetables, a pan filled with balsamic roasted brussels sprouts and shallots, and not only were they delicious but they were just so beautiful to look at. The tender caramelized sprouts with the sweet purple shallot looked like glistening jewels on the serving plate and I’ve been thinking about that image for the last four months and, as is the case when I can’t shake an obsession, I took those roasted Brussels out for another spin except this time they would be the main dish, along with some red onion as their side-kick. Along with the sprouts and onion, I added a whole head of garlic. Roasted garlic is a magical thing – it’s a softer, mellower version of its raw self. Just slice off the top of the garlic, drizzle the exposed cloves with olive oil, and wrap it in foil. Spread the trimmed Brussels sprouts and sliced red onion in a single layer on a large baking dish, toss them with olive oil and into a 400-degree oven it all goes, along with the garlic, for about 30 minutes. To take what normally might be a simple roasted vegetable side dish and make it a main course just add some pasta. In this case, gemelli. 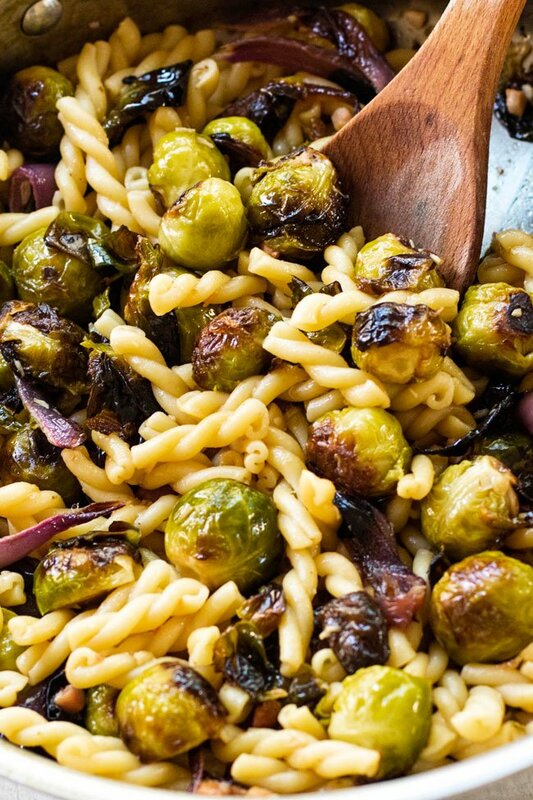 Any short pasta will work, like penne, rotini or cavatappi so use what you like (or can find). Once the veggies are roasted it all comes together starting with some diced pancetta. I sizzled some in a large pan until it released its fat before adding the soft roasted garlic (smooshed into a paste), the cooked pasta, a few squeezes of fresh lemon, and a handful of grated Parmesan. Then into the pan go the roasted vegetables and all it needs is a quick toss. This roasted vegetable pasta is a lighter dish, one that makes a nice post-holiday dinner when something not laden with a heavy sauce is a welcomed relief. It’s sort of like a pasta salad except each bite has soft caramelize winter vegetables and you serve it warm, although I did enjoy some of the leftovers straight from the fridge and it was delicious. 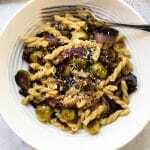 Roasted brussels sprouts, red onion, and garlic tossed with pancetta and pasta dressed in lemon juice and grated Parmesan cheese. Preheat oven to 400 degrees. Spread the sprouts and sliced onions in an even layer on a baking sheet. Drizzle 1 tbsp of olive oil over the top of the vegetables. Remove the loose outer papery skin from the head of garlic. Slice off just enough of the top of the garlic to expose the cloves. Place the garlic on a piece of tin foil and drizzle 1 tsp of olive over the top of the cloves. Wrap the garlic in the tin foil and place it on the baking sheet with the other veggies. Roast the veggies for 30 minutes. Once roasted, unwrap the garlic and, once it’s cool enough to handle, squeeze the softened cloves out of the bulb. Chop the cloves and smoosh them with the back of your knife until they form a paste. Bring a pot of water to a boil and cook the pasta according to package directions. While the pasta boils, heat 1 tsp of olive oil in a 10-inch pan over medium heat. Add the pancetta and cook it in the oil until it starts to release its own fat. Add the roasted vegetables and cooked pasta to the pan and stir to combine. Add the roasted garlic, lemon juice, parsley, and cheese. Stir again and serve. Planning to make this recipe? Be sure to rate it and share your feedback after you try it! I adore the roasted veggies here, especially the addition of brussels sprouts – so brilliant and tasty!